At Termini, good connections with Metro A and B.At Garbatella, the GuestHouse is not far from Metro B. You will find tickets available for tours with tour buses. We organize sightseeing tours with licensed guides. We organize transfers to / from airports, transfers to other cities and to visit Rome. 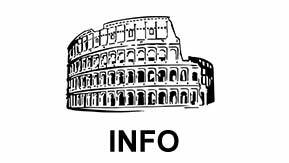 Visit the page to see the events planned in Rome! We are happy to provide all possible information about monuments and places of interest in the city! If you arrive outside the normal hours, contact us and we will find a solution!